Designed for a multitude of uses, Double TT maintenance fluid particularly excels in situations where lubrication, water displacement, penetration and corrosion protection are required. One of the functions is to provide light lubrication of hinges, door locks and much more. Double TT administers a lubricating film that provides reduced exposure to dirt pick-up, which can be abrasive. The product is designed to penetrate seized components, enabling them to be freed more easily without the risk of damage. Double TT contains searching solvents and additives which provide releasing properties and also leaving behind a residual lubricating film which aids dismantling. Double TT Maintenance spray stops electrical leakage by removing damp and moisture from the current flow – drying the electrical connections in items such as plugs, leads, coils, and batteries. Double TT Maintenance Spray is much less likely to be washed off in practical applications where water contact is likely as it is a light gel-like material. This means there is less tendency for the product to drain away, particularly on vertical surfaces. Due to these properties Double TT provides excellent corrosion prevention properties, which far exceed competitor product capabilities. 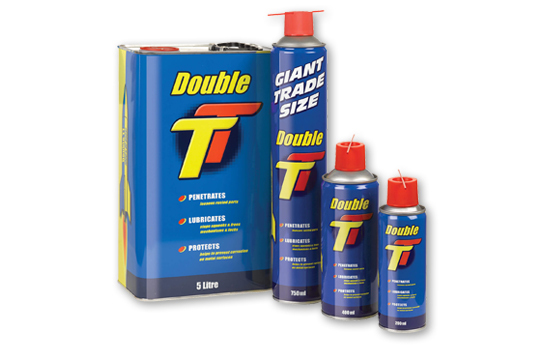 Double TT product is available in sizes ranging from 200ml through to 5 litre. The variety of different sizes allow the consumer to select the appropriate product for their application. The 200ml and 400ml products are suitable for infrequent household applications. The larger trade sizes such as the 600ml & 750ml aerosols and the 5 litre container are ideal for professional workshops.